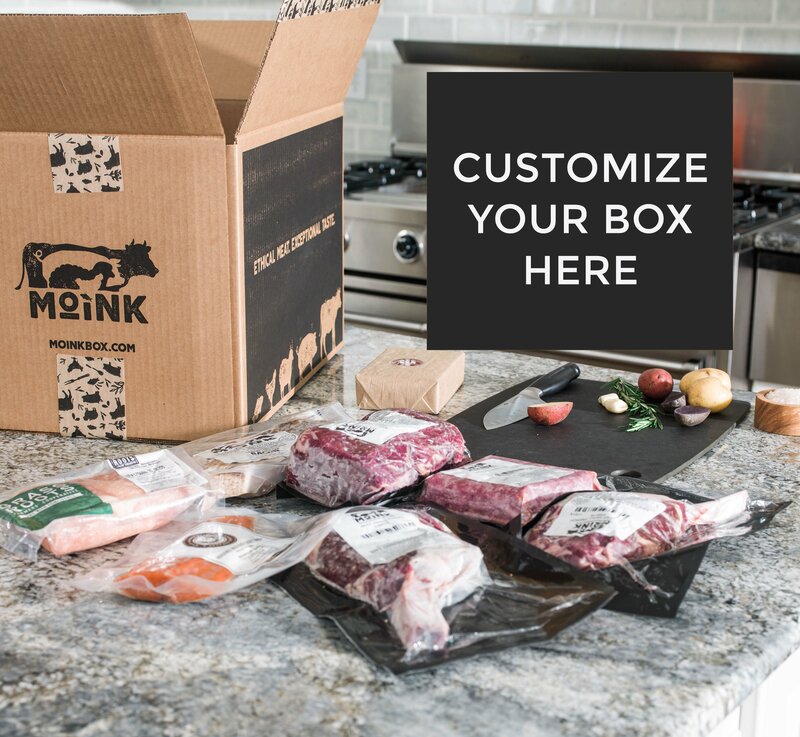 The Moink Difference: Ethically Sourced and Humanely Raised Meat. Why choose Moink over your local grocery store? Over other meat delivery services? We are farmer owned and offer ethically sourced and humanely raised meat…truly a cut above the rest. We care about the people we feed. Customer service – it’s what we do. Our animals are raised outdoors on pasture. Our beef and lamb are grass-fed and finished. Our pork is raised in the woods and on pasture, and never given GMOs. Our chickens are raised outdoors on pasture. Our fish is sustainably wild-caught in Alaska. We put great care into making sure our animals are humanely harvested. The majority of our hogs, cattle, and sheep are “farrow to finish,” meaning they spend their entire lives on the same farm with the same caretakers. We do not use confinement buildings. Our meat is antibiotic free. We do not use growth hormones. We do NOT feed GMO grains. Our finished product is not doctored to alter the taste or color. There are no solutions added to our chicken. Our chicken is air-chilled, not water-chilled. Our chickens are not dipped in chlorine. Our bacon is naked bacon (no additives or sugar). Our breakfast sausage is also made without sugar or additives. Want to know more? Read Our Story. I can’t believe it! This is all we talk about. We need so desperately to find places like this. We will pay for it. The need to have normal sized chickens and eggs with yokes that are a deep orange/yellow. We want to eat healthy but are only given crap to choose from. Thank you. Don’t believe the lie that we (customers) want what’s cheap and fast. We don’t want that. We want healthy, clean animals that are treated humanly. Forget the middle guy. If you can keep it coming directly to the consumer the better it is for us. Keep up the good work and i hope you don’t ever go away. I would love a section on “farmer of the month” with more pictures of their particular farm and lives. I will feel connected to you and would thing twice about cancelling my subscription if money gets tight if I feel that I part of your family. Just an idea. Maybe you already do it. I haven’t looked around the website yet.